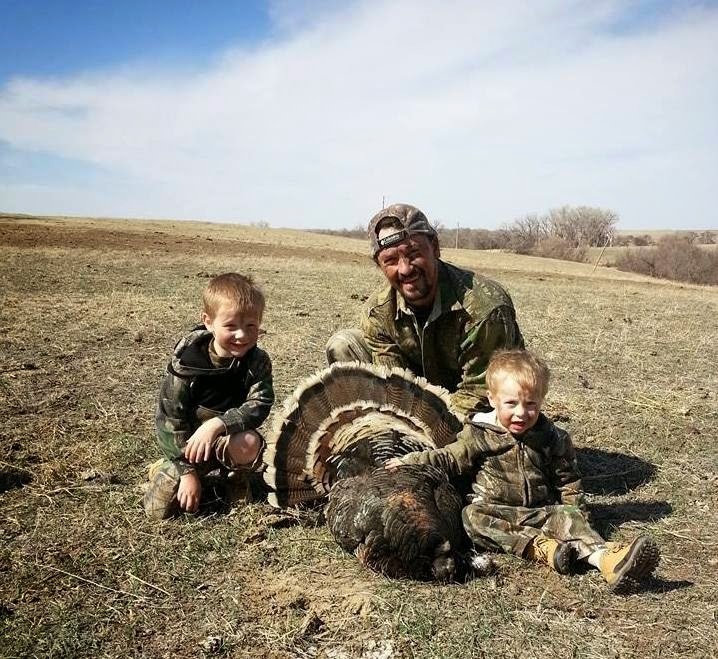 We drove out to Nebraska for the opening weekend of the turkey season. We always get out there and invade my cousin Chad's house to chase birds. Friday afternoon we rolled into town. The scouting report was good! There were hundreds of turkeys, still in their big winter flocks, hanging out on the property we have permission to hunt. We didn't bother them that evening, instead a couple of us built a gate and some fence for our rancher buddy, and the others chose to try and get on a few of the birds on some nearby public ground. The only turkey we managed to call in was this hen. I could have reached out of the blind and touched her. She hung out for an hour, and I thought surely this live decoy work out perfect, but a bearded turkey never materialized. No biggie, the next morning was going to be epic...or so I thought. We got into the field in the pitch dark on Saturday morning. We sat in the blind making coffee. I was waiting for the thunder of 100 gobbles that should have started any second. I waited, and waited, no turkey sounds. What the heck? It was finally light enough to see the main roosting area, about 700 yards away. I pulled up my binos, no turkeys. WHAT THE HECK! Where do 400 turkeys go? Come to find out, the landowner was chasing some trespassers that he saw on his property. They must have walked right under the roosts that night, as the birds had been in the same trees every night for a few months, and were now gone. I busted out the new Avian X strutter decoy...unfortunately I never got to find out how it worked. That is Danny's most killenest arrow. He killed an elk, two deer, and a hog with it. He missed another hog and lost the arrow, only to have it found by another group of Colorado hunters the next week. They found it by chance on a 20,000 acre ranch. 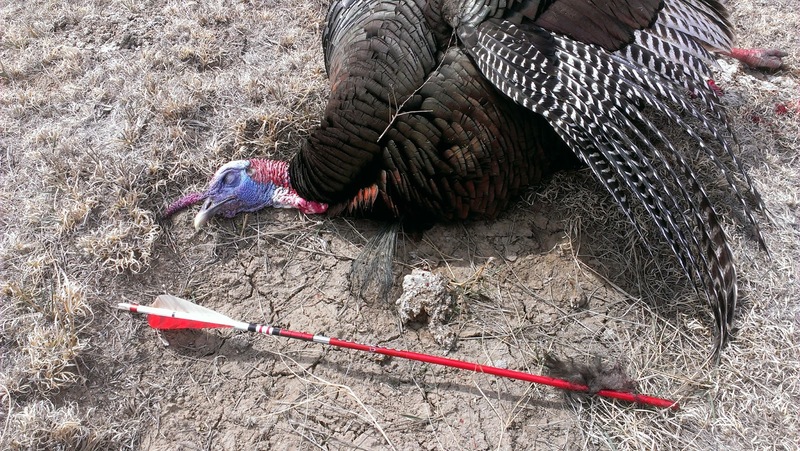 Finally, after all that action, the arrow was broken by this turkey. My cousin, Tyler, brought his wife and two young boys out with him a few miles to the north. 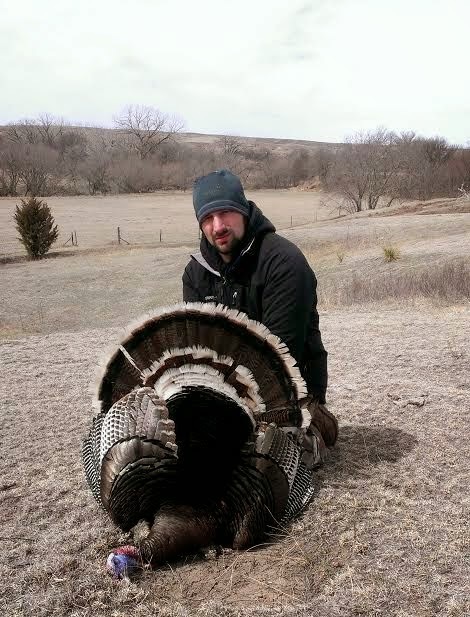 They had a great time, and Tyler made a fantastic shot on this gobbler. Ty's wife had to put her hand around their younger son's mouth as the turkey came within range. Good times! Ty shot him with a Chargin' Bull recurve. Tyler's brother, Chad, was with Andy to the NW of us a few miles. Chad and Andy had a great morning. 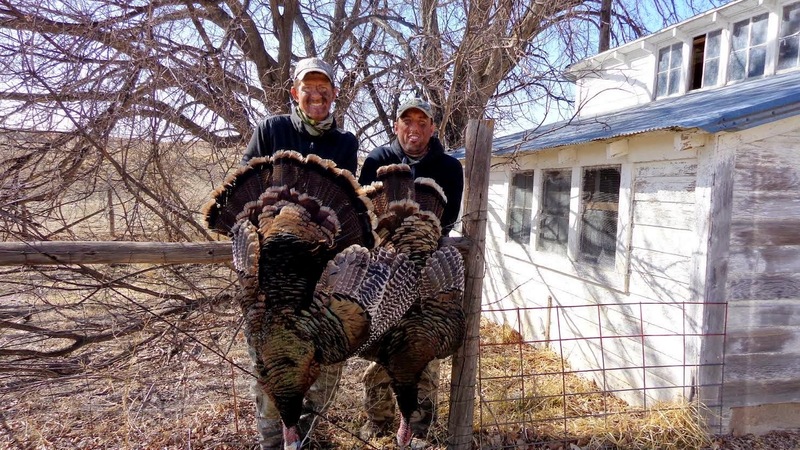 These guys are killers, two shots, two dead turkeys. Andy shoots a Bob Morrison recurve. Chad shoots a Chargin' Bull recurve that he makes. Now don't get me wrong, our group killed four turkeys on Saturday, but it wasn't the turkey shootathon that we thought it would be. With all of the birds gone Kelly and I drove to one of my public land honey holes for the next few days. There were lots of turkeys but they were using completely different fields and different roosts than I've observed in the past. The first day we heard them all around us, but never got anything to commit to our calls. We were always on the wrong end of the field, wrong side of the creek, etc. Monday morning's forecast called for brutal winds. We've hunted this area enough to know where the turkeys go to protect themselves from the wind. Kelly and I got all set up on the edge of a milo field with a bluff behind us. The weatherman was right. The wind was crazy! Our spot at the base of the bluff protected us from the hardest winds. Several hours into the morning we had yet to hear or see a turkey. The day before, in this exact spot, a group of hens started yacking up a storm. Six gobblers coming from every direction were soon strutting in the field. That got me thinking...Ten of me couldn't make as much noise as the real turkeys were making the day before. But by God I was going to try! I got my box call in my hand and put my diaphragm call in my mouth. Over the next five minutes I got to work! YAP! YAP! YAP! I HAMMERED AWAY, as loud and hard as I could. I had to penetrate the wind. Ten minutes later I got bored and picked up my box call. YAP! YAP! YAP! I looked out into the field. Uh-oh. I'm calling like an idiot and there are two big ol' toms in full strut just 50 yards away. I set the call down and got my bow ready. The two toms were perfectly content to just stand where they were. Over the next hour the toms made their way to the base of the bluff behind us. They just sat there, strutting, occasionally gobbling, but making no hint at moving towards our decoys. The birds were only 15-20 yards away, but behind a a mess of branches. Kelly started telling me that there was an opening. I said no way. Kelly insisted that if the bird took three more steps to the left that there was an opening. I studied the branches, he's right! I got my bow ready. The turkey took the three steps we were hoping for. As I reached full draw I completely lost focus on the bird. My eyes studied the branches, I aimed for the opening, I could still see the turkey in my blurred vision. This is going to work! The Snuffer on the end of my cedar arrow barely fit through the tiny opening. I missed the branches completely and the arrow zipped right through the turkey. The tom ran up the bluff and out of sight. After a very short search we found him underneath a cedar tree, dead. The turkey was about in the middle of the frame when I shot. Chargin' Bull recurve, cedar arrow, Snuffer broadhead. This is mostly common sense, but hunting usually is. Observe animal behavior under the conditions, and use those observations to anticipate their future location/mood/vocalizations/etc. 1) Knowing an area is invaluable. Having observed turkey behavior in high winds, in this area, we had a good idea where to intercept a tom. The bluff we were set up on is long, maybe a half mile. We knew we had to be patient, they'd be somewhere along this bluff for sure, and eventually they would be near us. 2) Patience: The turkeys came to my calls at 11am. I am willing to bet that, even with the high winds, they were within ear shot of my calls before that. Toms are not going to leave their hens early in the morning. Knowing this gave us the patience and confidence to sit tight. Turkeys are quite pattern-able in this area at this time of the year. If they know you're there, they will usually come check you out at some point. 3) Make adjustments: On the first day in this area we positioned ourselves in all of the "right" places, based on previous experience. This year was different. We observed the turkey's behavior and adjusted for the following day. I've killed a bunch of turkeys in this area, but never from this spot. It is usually not a good place to be. We put ourselves where the turkeys were. 4) Calling: Everybody has their own thoughts on calling. The day before we heard hens calling IN FORCE from this corner of the field. We observed toms congregate on their calls. As a matter of fact, every single year we hear hens going crazy wild early in the season. We called like the turkeys call. Our calling was insane, loud, and long...exactly how live birds call this time of the year. Will I call that way in May? No. But in March? You bet! I wish I was going back out this year but I've got a baby girl coming soon. It's time for me to stick close to home. I should have one or two more good stories from the RMSGear crew though. Good luck turkey hunters!